About The Friends of the Wild Flower Inc. Your comments are requested on the new draft of our Articles of Incorporation. Download this file and email us any comments prior to the annual meeting on May 20 where an approval vote will be taken. The Friends of the Wild Flower Garden, Inc. is a 501(c)(3) Minnesota Non-profit corporation founded in 1952 by a group of private citizens. Our purpose is to protect, preserve, and promote the interests of the Eloise Butler Wildflower Garden and Bird Sanctuary for its unique beauty and as a sanctuary for native flora and fauna of Minnesota, and to educate and inspire people of all ages in relating to the natural world. We offer assistance for the garden in the form of funding and volunteer support. (Mission Statement.) You can support our mission by your membership, memorials and donations. Membership is open to any interested person or organization that wishes to support the Garden. Members and supporters of the Friends receive a periodic newsletter, The Fringed Gentian™. Information tabs about the Friends at page bottom. Membership fees, donations and memorials to the friends are tax deductible. These amounts fund our program of educating the public, providing funding and volunteer support for the Eloise Butler Wildflower Garden & Bird Sanctuary, and funding transportation grants for students to visit the Garden. The Friends have no paid staff, no offices and maintain non-program expenses to less than 5% of revenue. Memorials "in honor of" a living person or memorials for a deceased person are accepted and encouraged. For more information on membership or donations and memorials please click the Membership or Donations button above. 1952: Clinton Odell describes the Garden and why he started The Friends of the Wild Flower Garden. The Spring 2019 issue issue of The Fringed Gentian™ will be available approximately April 15. Contact editor Colin Bartol (e-mail) on any questions. Past issues are available in the newsletter PDF archive. Information tabs about the Friends. 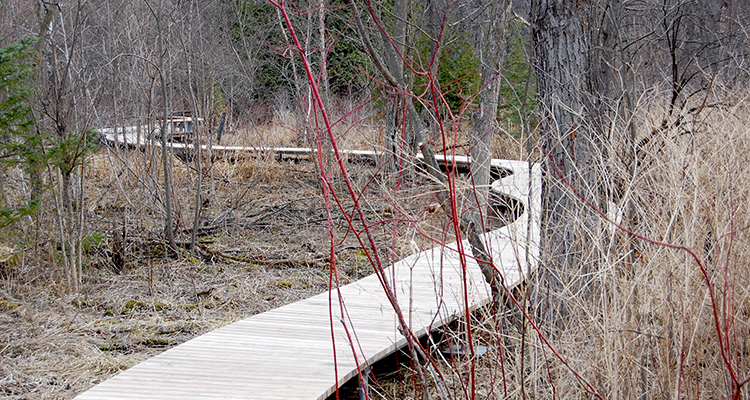 Below: Our most recent major project - Phase II of the wetland boardwalk. Dedication on April 26 at 3PM.